All In All You’re Just A . . .
As you may already know, homeschooling is with rare exception illegal in Germany, as well as many other countries. Over the last few years Sweden and Germany have become more tyrannical over the issue, even raiding homes SWAT-style, removing children and putting parents in jail. The criteria to which you refer are race, religion, nationality, political opinion, and social group. I could reasonably argue that social group and political opinion apply, but the most obvious criterion is religion. Want to take another stab at your argument that their decision to homeschool is not religiously based? He did not want to take another stab. The 6th Circuit ruled several weeks ago that the German homeschooling-and-evangelical-Christian family is not eligible for refugee status and should be deported. The Romeikes appealed for a rehearing en banc. The DOJ responded on the 26th of June. At this point, the parties are waiting to see if the 6th Circuit will grant the rehearing. If they do not, the Romeikes’ next step will be to appeal directly to SCOTUS. Now I’ve had a peek at the two latest briefs. They aren’t long or complicated. Basically, the Petitioners said the 6th Circuit panel did not follow precedent for evaluating asylum claims, and further that the panel’s new rule is flawed and the decision erroneous. The United States responded first with the obligatory standard of proof argument that every party not bearing heightened scrutiny uses in the hopes of winning without getting to the merits of the case. Then they basically said nuh-uh, they did too decide correctly. The arguments are mainly legal, but the DOJ also disagrees on a crucial point of fact: whether the German government uses its compulsory attendance law in order to prevent Christians from homeschooling their children for religious reasons. Appellate courts give deference to trial-level findings of fact. Since this was an administrative case, the trial level wasn’t in a federal district court, but rather before an administrative judge, who granted the Romeikes’ request for asylum. In order to rule in their favor, the judge must have made factual findings in favor of the Romeikes. Yet, the only reference to findings of fact is in a DOJ reference to the “Board.” How that relates to the administrative judge’s decision, I do not know. Konrad, Bundesver-fassungsgericht [Federal Constitutional Court] April 29, 2003, 1 BvR 436/03 (F.R.G.). A.R. 760. Romeike continues to make much of a single line in a German court’s opinion upholding the law here, indicating that the public has an interest in counteracting the development of religious or philosophically motivated “parallel societies.” . . . But one need look no further than the same paragraph from which the “offending” line is drawn to determine that . . . the law has nothing to do with marginalizing Romeike based on any protected status. The subtle misuse of quotation marks is a nice touch–using them only for the “parallel society,” which should really be a quote within a quote, then coupling it with “offending,” which isn’t a quote at all but a sly way to say yeah right. The impression is that the “parallel society” phrase might merely be the Petitioners’ over-dramatization, rather than, you know, the actual words used by the German court to describe homeschoolers. For anyone whose eyes keep sliding off this formidable bulwark of progressive platitude (dialog with dissenters! experienced tolerance! sustainably develop! ), let me rephrase: we have to be intolerant of you in order to teach your children tolerance. I can’t help but admire this reasoning. It’s a perfect example of Orwellian doublespeak–a work of art, assuming you can buy the idea that lying is an art. Now, I’m no fancy German judge nor United States attorney, but I’m pretty sure that a “religiously motivated ‘parallel society'” is a social group. You know, one of those little criterion for being granted asylum in the United States if you have a well-grounded fear of being persecuted for membership in it. Interestingly, social groups to whom the United States has granted asylum in the past include parents of Burmese student dissidents, Mexican men who identify themselves as women and are sexually attracted to other men, and former members of a Salvadoran street gang. Yet religiously motivated homeschoolers aren’t a social group within the context of asylum? And threats of jail and loss of your children defo isn’t persecution. This post has grown too long, the hour has grown too late, and I just used “defo” in a sentence. I need to wrap things up. How Did the Fast & Furious Protest at the White House Go Today? Let’s just say that the Secret Service shut it down within less than an hour. Some sort of ‘mysterious package’ was discovered. So I got there 15 minutes late and the whole thing was shut down within 20 minutes of my arrival and we were all pushed off the premises. Bryan Preston has the story as I related it to him, plus some pics and video I took. Including when the bicycle cop told me to stop filming. 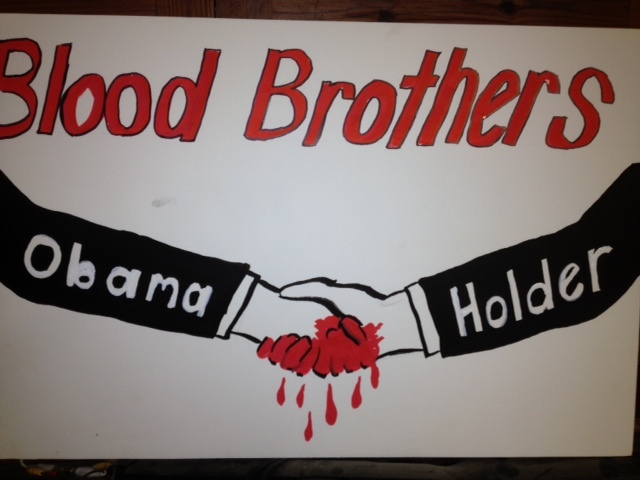 to the first protest against Attorney General Holder and Obama. And I didn’t even get a chance to deploy my sign. There is a protest brewing on the North Lawn of the White House, Monday, July 2 from 10-12:30. This is as much a protest against the President and his Attorney General as it is against the criminal news media who have been scuttling this story in order to provide cover for the Emperor. Obama doesn’t give a damn about the 400 Mexicans who died because he let thousands of guns walk. He doesn’t give a damn about Brian Terry, either. 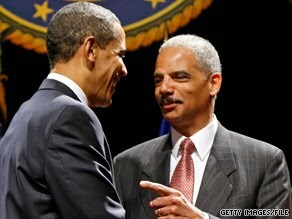 Obama and Holder engineered this carnage so that he could advance their gun grabbing agenda. See how these leftists work? Body count doesn’t matter as long as it advances their agenda. Well, it’s time that dem boys heard from us loud and clear! I’ve already got some sign ideas. Front: What Are You Hiding? Back: Who You Gonna Blame THIS Time? We should also co-opt that old Crosby, Stills and Nash song as a chant…. Four Hundred Dead in Mex-i-co!! Four Hundred Dead in Mex-i-co!! Where: Washington, DC. Lafayatte Park, North Lawn. Go to PJTV to see more. Update: Yesterday they liberal who was fired by PBS and now works at Fox News, the very same liberal we all supported because of his shoddy treatment by his own brethren on the left, yes, Juan Williams made a fool of himself on ‘The Five’ yesterday trying to defend Preezie’s cover up. He was reprehensible. ‘Hey people die’???? The Right Scoop has the transcript and the video. Juan Williams just made himself another victim of Obama’s Fast and Furious scandal. FNC will be hearing from me. Maybe they’ll hear from you, too. Today, just prior to the hearing and vote on whether to charge Attorney General Eric Holder with Contempt of Congress for withholding documents that had been under subpoeana for well over a year, the President just invoked Executive Privilege over those documents. So, we have a dead border agent as the result of actions taken at a level that appears to originate from the very top, otherwise this Executive Privilege decree would not have been invoked. Executive Privilege did not work during Watergate, but it may work here because this lawless president simply ignores the other branches of government when they displease His Royal Highness. Remember when Mark Levin used to call candidate Obama, Barack Milhouse Obama when his opponent objected to us using his full name? How precient, Dr. Levin. Obama Walking the Plank of His Own Making. Fellow Democrats Sawing Plank. Schadenfreude. It’s what’s for dinner. Democrats are running away from Obamacare, which will likely be ruled unconstitutional in June. Some of us were at your office, providing such advice to this affect during the run up to this vote, Jimmy. I saw you walking down the hallway towards your office and once you saw us gathered outside your office you ran from us. We were there and we were ignored. Now you hike up your skirt and run away from a re-election bid because you know you screwed up big time. No worries though, mate. We’ll release the same fury against your replacement candidate, Timmy Kaine, that we would have on you. Timmy is a big Obama guy. Big Obama guys don’t do so well with the electorate since 2008. And then there’s this from former Congressman Artur Davis from Alabama. And now Democrats are running away from President Obama’s blockage of the Keystone XL Pipeline. Funny how constituent feedback about the pain at the pump brings new wisdom to even the most radically green Democrats. Sharks are swirling below the plank. Sharks of Obama’s own creation. Shutting down and restricting coal fired power plants isn’t going to help, either. When electricity rates ‘necessarily skyrocket’ (your words, not mine) going into the cooling season, this will add more pressure. Coal fired power plants are shutting down because of Obama. When GSA employees lavishly waste taxpayer money and flaunt it on You Tube, that doesn’t help either. 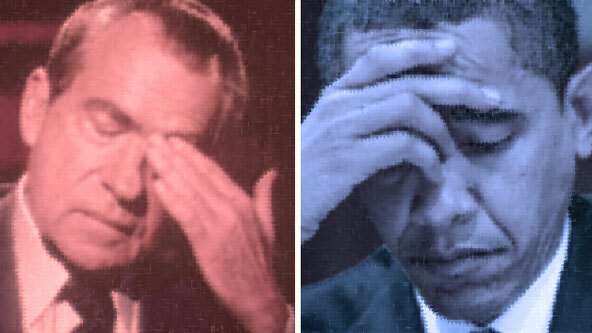 When Obama uses the Justice Department to promote illegal gun running resulting in the deaths of American border and ICE agents and this Justice Department turns a blind eye to voter intimidation perpetrated by the Black Panthers while harassing states over voter ID laws and immigration enforcement laws, that doesn’t help either. When Obama racks up $5 Trillion in debt in 3 years, tosses our money at pet projects that are massive failures like Solyndra, LightSquared, and others, that doesn’t help either. When Obama takes an unprecedented number of vacations while the ranks of the unemployed moved from gainful employment and self esteem onto demeaning government dependency, well that don’t much help, either. You know what, Champ? You’re doomed. If your cratering poll numbers don’t advise you, then your own party distancing themselves from you certainly does. America’s got a big party planned for November 6th. A major hat tip to commenter Linda for bringing this incredible video to my attention. She runs a blog called NoOneOfAnyImport and it seems that she has seriously undersold herself with that name. What you have here is vitally important and needs to go viral. Not sure if DTN is the platform. But maybe it can provide a little boost. I made a throwaway post about the amount of spam email begging for money that I get from the Obama operation last week. But Linda points us to a video where the Obamafia have suspended credit card security, allow multiple names for the same card. allow foreign addresses and will take funds from virtually anyone, including Nidal Hassan. The video also shows that Mitt and Rick are playing by the rules. Watch this, make your own conclusions and get back to me. And her. I would characterize this as UNBELIEVABLE, but it isn’t. Not one little bit. America, your republic is under siege from lawless thugs, in case you didn’t already know. Sorry I Was Missing for a While. Nasty PC Virus Requiring Geek Intervention Kept Me Out of the Battle. But NOTHING BAD HAPPENED in my Absence. THE HORROR!!! When Democrat Pillow Talk Goes Open Mike the CoverUp Goes Epic. What the Grass Roots Hath Wrought. The Amazing Journey of Dave Brat. The Post Office is doomed to fail as Obama intervenes to craft a fix.